Pip Wilson bhp: I challenge you to write out a Mission Statement - even if no-one sees it it will be developmental. 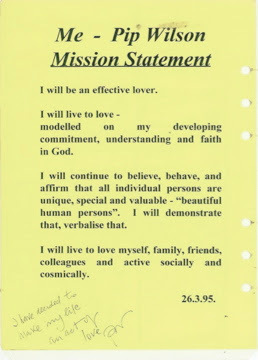 I challenge you to write out a Mission Statement - even if no-one sees it it will be developmental. being inspired by all the people I meet and love. and active socially and cosmically.